To keep going, pressing forward; never stopping, persistent. Example: Patrick is having a rough month. He lost his job a few weeks ago, and now he’s running low on cash. With the bills starting to pile up, he’s worried that he won’t have enough money to keep the lights on. Despite these circumstances, Patrick will keep on truckin’ no mater what obstacles come his way. He’s looking for work and hopes his situation will improve. In other words, he’ll keep pressing on and will not let his recent troubles bog him down. Harsh weather won’t stop a truck from making its deliveries. A beautiful sunny day on the other hand? Well… yeah, that won’t stop it either. When you’re out driving on the road, a common sight to see are these big 18-wheelers riding alongside you. Much of the time, these massive trucks are delivering cargo from one placer to another. The people who drive them are pretty much expected to work long hours. 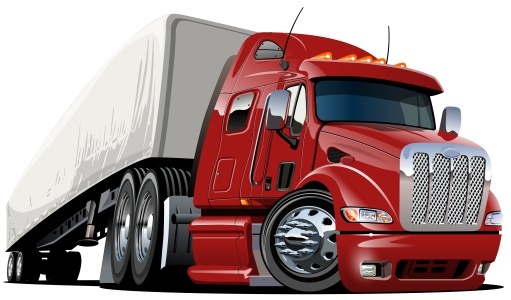 Truck drivers also travel even in harsh weather conditions like rain or snow. Alright, rain isn’t that harsh, but you get the idea. The point is that trucks are constantly pressing on towards their destinations, making those deliveries! In conclusion, since the phrase was used in a 1936 song, this would mean it’s at least 83 years old. The sentences below will use the idiom, or they will use a synonymous phrase in place of it. I didn’t get much sleep last night and I have to show up for work in an hour. This obviously is not an ideal way to start the day, but I’ll just have to keep on truckin’ despite how sleepy I am. Now that my cat is older, he’s run into a handful of health problems. He’s on two different medications that should help, so hopefully he can keep the ball rolling for several more years. Note: Do you know what idiomatic expressions are? If not, or if you just want to see some idioms with sentences, head on over and give that a look. There are several examples on there that can help you learn all about them! Anyways, the quotes that contain a particular phrase may be taken from old newspapers, poems, or books that were written centuries ago, but this by no means confirms that the phrase originates from said newspapers, poems, or books. In all likelihood, if an expression is being used in a newspaper, it’s probably already a well known saying and is from an older time.